Our range of products include wastewater primary treatment dissolved air flotation units. Max. Capacity Excluding Recycle 1247 m3/hr. 1. Daftech clarifier has a retention time of 3 minutes against 2 hours in a sedimentation clarifier. 2. TSS removal of 98% is possible whereas in a conventional clarifier the average efficiency does not exceed 70%. 3. Oil removal down to 10 ppm is possible whereas in a conventional clarifier there is no possibility of removing O&G. 4. The higher efficiency of BOD removal in a DAF clarifier results in lower energy consumption in downstream biology. 5. Sludge consistency as high as 3 to 3.5% is achievable against 1 to 1.2% in a sedimentation clarifier. 6. 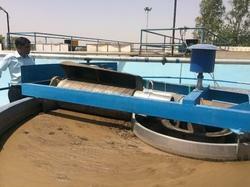 Sludge flows by gravity whereas in a conventional clarifier sludge transfer would require sludge pumps.